When Carmen Davis-Stevens needs a table, she doesn’t spend hard-earned money to purchase one. She simply makes what she needs out of materials on hand. 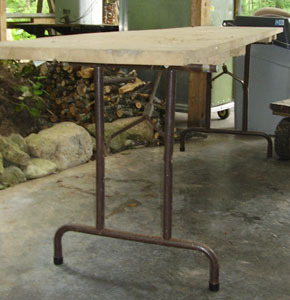 As an honorary Fiercely Frugal Savage Sister, Carmen shares with us how she made two such tables. The blue plastic box under the stainless-steel table top holds an electric meat grinder for sausage-making. "My husband makes a mean Kielbasa," Carmen reports. One day Carmen’s husband brought home a piece of stainless steel from a school kitchen because he thought it would serve as a drain board in their own summer kitchen. Carmen’s sister took one look and declared it would make a perfect “pig table.” Since Carmen and her husband have pig roasts once in awhile, that made sense to them. Carmen used an old, bulky desk for the table’s base. Its mouse-proof drawers work well for utensil storage. 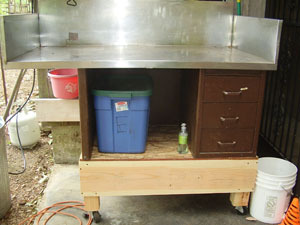 Even though the stainless-steel top isn’t fastened down with screws, Carmen says it fits great and doesn’t move around. The metal can also be sanitized easily. A hole allows grease from the cooked pig to drip into a bucket that hangs from a hook below. At first Carmen set the pig table on an old wheeled bed frame so they could push it around easily, but result ended up being too low for her tall husband to use. She solved the problem by crafting a high wooden base with large wheels. When Carmen’s folding table died after being packed and unpacked a zillion times to display market wares, Carmen decided to give it a second life. She removed the legs from the old tabletop and attached them to wood planks in the same manner that she replaced a large wagon’s platform. The resurrected table served at the market for many more years and also accompanied the family on camping trips. “When it died, I had already quit the market,” Carmen says. She made a new top that measured about twelve feet long. She reports that the table’s third incarnation will last a long time because she doesn’t fold the table anymore. A little creativity and a “nothing ventured, nothing gained” attitude will allow you to create clever tables too out of materials you have on hand. And when you do, be sure to share your success with us in the comment section. This entry was posted in Carmen's Corner and tagged creative solutions, furniture, recycling, trash to treasure. Bookmark the permalink.